The iconic Merriam-Webster has been reinvented as a comprehensive online dictionary for today’s student. 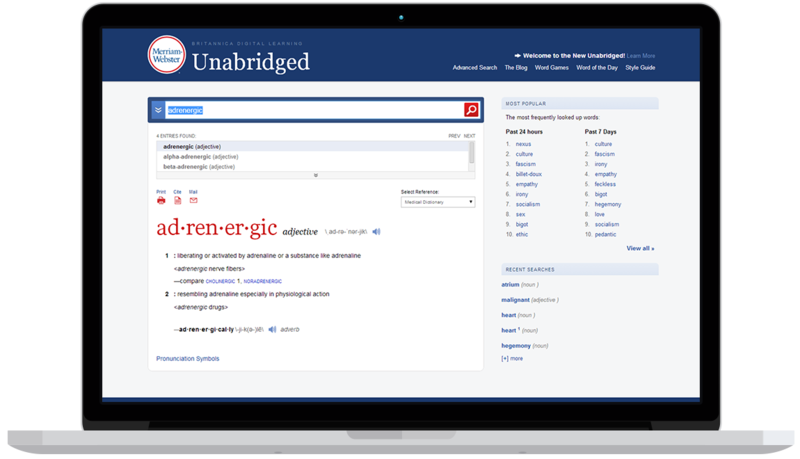 Merriam-Webster Unabridged online dictionary provides wide-ranging language support. In addition to the meanings of words, it shows their etymology and allows advanced search features, including searching by definition, function and date. The online dictionary gives students the ability to search using partial definitions and keywords, enabling them to reverse lookup words to build their vocabulary. For those new to a subject area, the dictionary is a useful jargon-buster, helping them to quickly look up and understand new terms. For those learning English as a second language (ESL), the online dictionary provides support in the form of audio pronunciations, example phrases and a thesaurus. A wide range of support materials, including ask the editor, editors’ blog posts about language and lists of recent additions, provide students with a deep and engaging language resource.